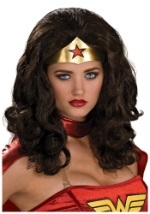 Being Wonder Woman has never been easier, or more comfortable, for that matter! 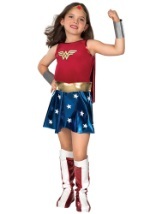 This Wonder Woman costume for kids includes a t-shirt, headband, and cape. 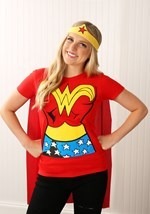 The red 100% cotton t-shirt has Wonder Woman screenprinting on the front that recreates her classic costume, including the big double "W", her yellow belt, and star spangled shorts. 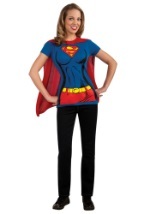 The red cape attaches to the back of the shoulders with Velcro and is about the same length as the t-shirt. Topping the whole look off is the polyfoam headband, which is in a crown shape, and includes the red star on the front. This headband stays on with the elastic band in the back. 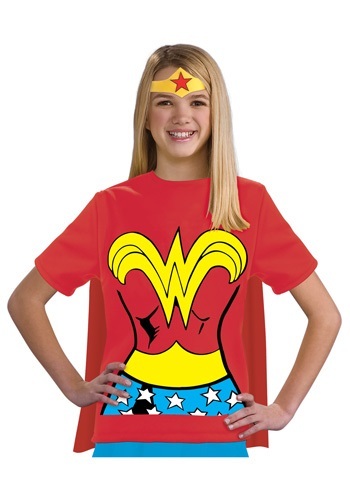 She'll be ready to defend Earth from its foes when she goes in this kids size Wonder Woman t-shirt costume!